We wanted to get out for a _real_ Colorado mountain hike before the wedding, and in our minds that means doing a 14er (a 14,000+ ft peak). 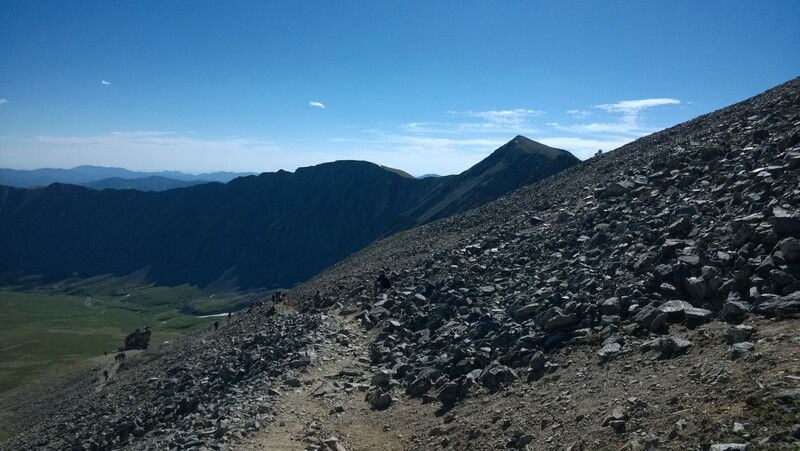 There are many options, few within close-ish proximity to Denver, but one of them is Grays Peak–on that note I wanted to give a shoutout to a great website, 14ers.com, that has more information than you can shake a stick at around hiking in Colorado mountains. 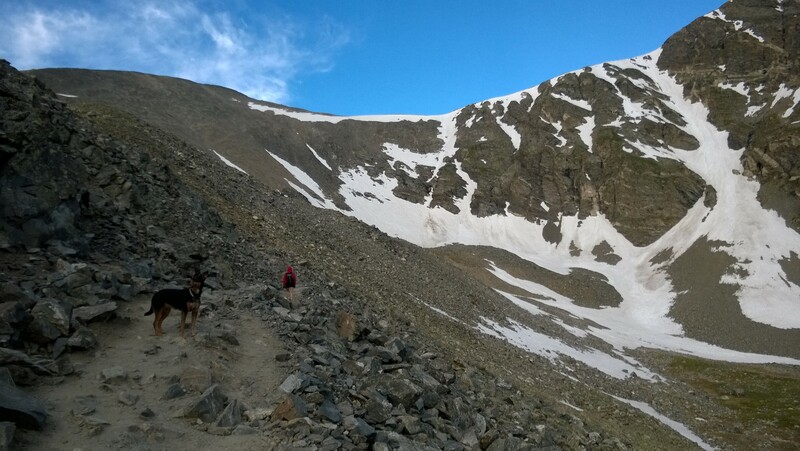 This trip is a 8 mile round-trip in which you can actually hit TWO 14ers, Grays and Torreys. We planned on doing both, but by the time we hit Grays we were DONE. Perhaps the best tip about hiking a 14er is Start early! This means boots on the trail around 5am. The main reason is to avoid summer lightning storms, which frequently occurs without warning in summer afternoons. You don’t want to be stuck above the tree line during one of these. Not to mention the sun can be brutally hot during the day. Note that even at 5am you are going to be in the middle of pack of people–I believe there were literally a thousand people hiking by the time we finished at 10am. We drove to the basecamp on Saturday night to sleep and make the early start. There were so many campsites and vehicles by the time we got there, but the next day there were hundreds. We did stop for dinner on our way to Grays at Georgetown, CO at a delicious Mexican restaurant that was started by who else but a Minnesotan. Cute little town. We slept in the Forester and it was not so much sleeping, but moving around uncomfortably all night waiting for 4:30am so we could start hiking. We heard cars rolling in as early as 3:30am. The start of the hike is through beautiful mountain meadows, with wildflowers and rolling streams, flanked on both sides by tall, granite peaks. Absolutely picture-perfect Colorado mountain valley. Beth and Snickers were doing great on the way up, but I am pretty sensitive to the altitude; I was feeling pretty green- nauseous, light-headed, and oh so wore out. It was GRUELING! Check out our Grays Peak Garmin tracks–we did 2,880 ft of gain, most of it during the last half of the uphill portion of the hike. There were plenty of people in the same boat as me, we passed quite a few, then quite a few others passed us. It was like a highway out there. The relief we felt when we hit the top was palpable. The thing that kept me going was thinking of going down! 🙂 However, the vista at the top was fantastic. See the pics below, but everyone seemed to be in the same place as us. As warm as it was hiking in the sun, the top was cold and windy! Rocky and snowy in July. See the mountain goats in the background?? We really made up time heading back down the mountain. That’s not to say it was easy- it seemed so much longer going down. Gotta say, the down is when trekking poles really earn their keep. A few miles down my legs get wobbly and the rocks give more often beneath my feet. By 10am we were back at the car, a 25 min drive 3 miles down the car-lined (yes a 3 mile line of cars!!) and we were back on I-70. The Forester handled it well, but it’s worth noting that we saw some car with less clearance had hit a rock hard and was leaking SOMETHING all the way down–not sure if they even knew it since we didn’t see them on the side of the road. We were back home before noon and eating pizza and breadsticks as a reward not more than 30 min later. It was a well-deserved afternoon nap. Beth and I have been doing a monthly monthly food and beer pairing for a year and a half now. The pairing is suggested from an Etsy calendar that really has no authority on beer or food, but it is fun and delicious to try it out! Include a range and variety of cheese milk types, flavors and textures- we included the soft taleggio, resilient fontina, and sharp blue. The taleggio was a bit earthy, the fontina a delicious mild cheddar flavor, and the blue very sharp and funky. Choose a variety of meats- we stuck with some classics salamis that were spicy (Olli) and tangy (Crminelli) and also wanted to try something different (Prosciutto spread). Both the salamis were as expected, but the spread I would pass on- a strong cayenne flavor that overpowered it.